Common blackbirds select different materials, with varying biomechanical properties, to construct different parts of their nest. This study tested the hypothesis that outer components of a nest have a more structural role and so are stronger than materials used to line the cup. Blackbird nests were measured prior to being dismantled to isolate structural components which were tested for mechanical strength and rigidity. Outer nest wall materials were significantly thicker, stronger and more rigid than materials in the inner structural wall or the cup lining. In the vertical plane materials used in the structural wall did not differ. By contrast, lining materials from the bottom of the nest cup were significantly thicker, stronger and more rigid than materials from the top of the cup. 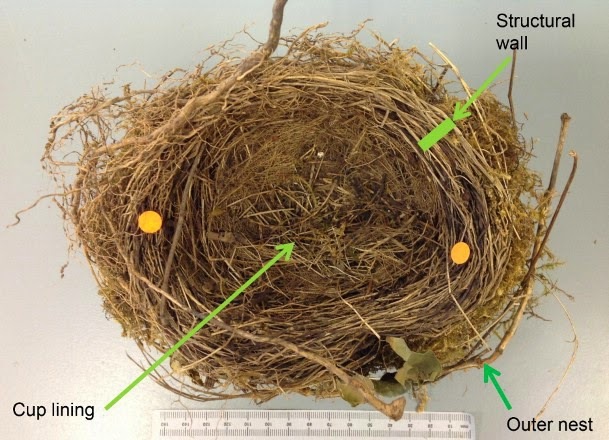 Blackbirds use different materials in nest construction roles suited to their properties and so may be able to recognize the structural properties of these materials. Materials on the outside of the nest may have a key structural role during construction. A blackbird nest from above with arrows indicating the position of the outer nest layer, the structural layer and the cup lining. Orange dots indicate ends of longest axis of the nest. Ruler indicates mm/cm scale.